Nopal growing cactus of the genus Opuntia also known as Prickly Pear cactus, Nopal perennial plant and also used as ornamental plant, can grow in mediterranean, desert, subtropical, temperate, tropic climate and growing in hardiness zone 8+. 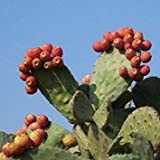 Mostly refer to the Prickly pear without a lot of spines and more tender branch mostly the fruit are the part that eat in those spices. Stem is edible and called cladode some refers them as leaves, harvesting all year when the cladode young. Flower color orange yellow or pink, fruit are also edible but mostly not use for eat, fruit color mostly red. What can be done with big quantities of Nopal fruits?